We know the word trend might not be a one to associate with a silk saree when this ensemble is actually meant for traditional looks. However you really don’t need to bore yourself with standard blouse models and patterns without giving a break. 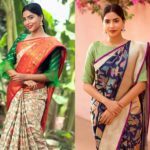 Considering that a good silk saree stays lifelong with us, and even passed on to our daughters, it is always essential that you take care in trying out something new on your blouse style to compliment the drape. Of course there are numerous modern blouse styles (bell sleeves, roomy bodice..etc) that are making us go weak this season. 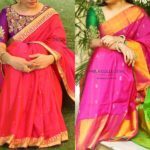 However, all of which may not be a best bet to try with traditional sarees if you are not comfortable on modish blouse options. In this case, you need to play subtle and not go overboard with your blouse choices to keep your look grounded and arresting. 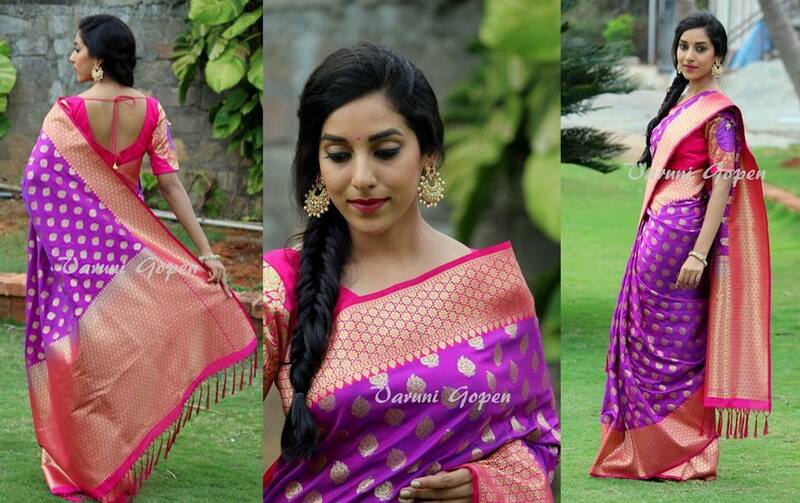 So what else you can try with your silk saree blouse? 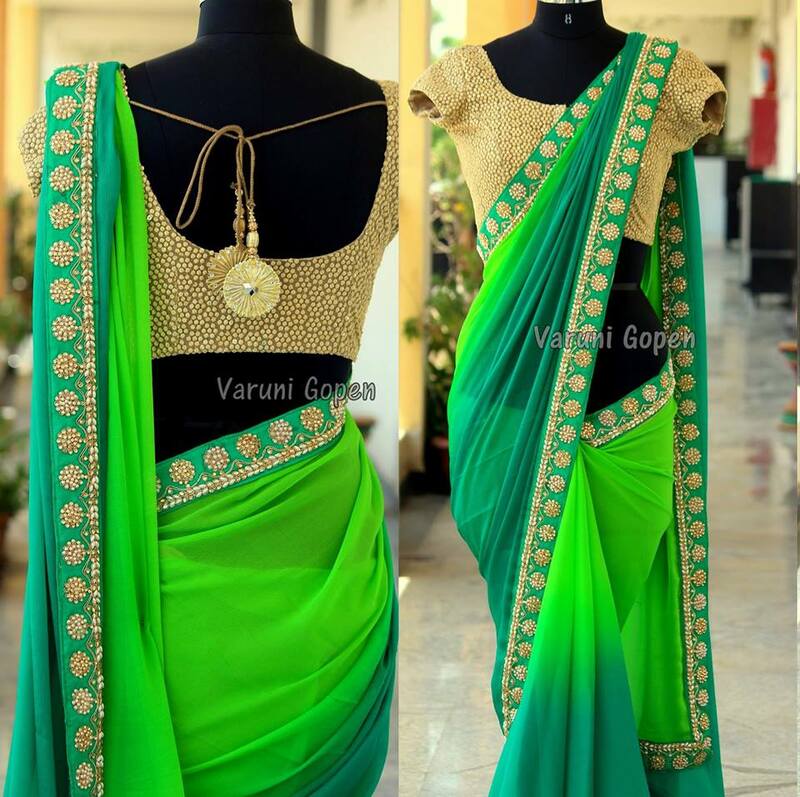 We went for another round of search for practical blouse ideas and dug out more than 30+ cool blouse back neck designs from the online boutique ‘Varuni Gopen’ that would give the right amount of style to your silk sarees. 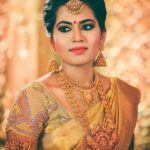 We have huge admiration for this boutique for their exotic saree collections and one-of-its-kind blouse models they sell along. So we seek great pleasure in scouring simple and trendy blouse models from this label and sharing it with you. 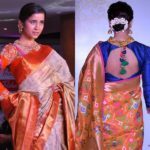 Now scroll down to check out chic blouse back neck designs that won’t overwhelm you to wear with your silk sarees. Give your plain silk blouse a boost, by opting for a bold stone work and fashionable tiebacks. 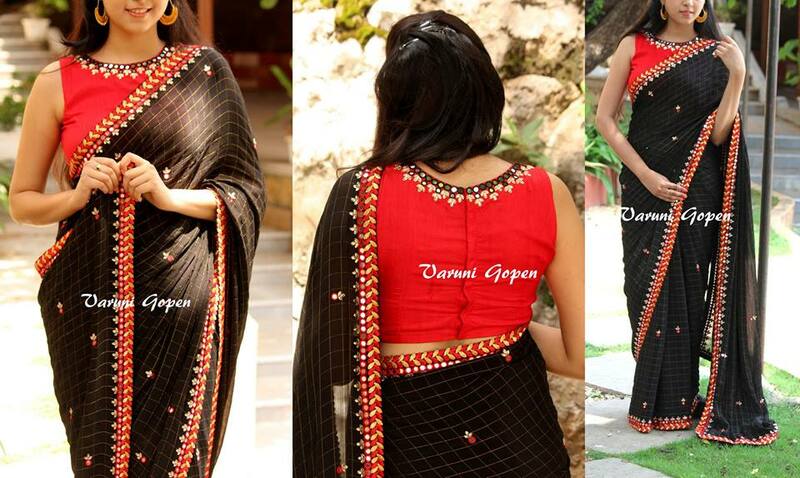 Either you can go for same color stones or contrasting tones to match the saree. 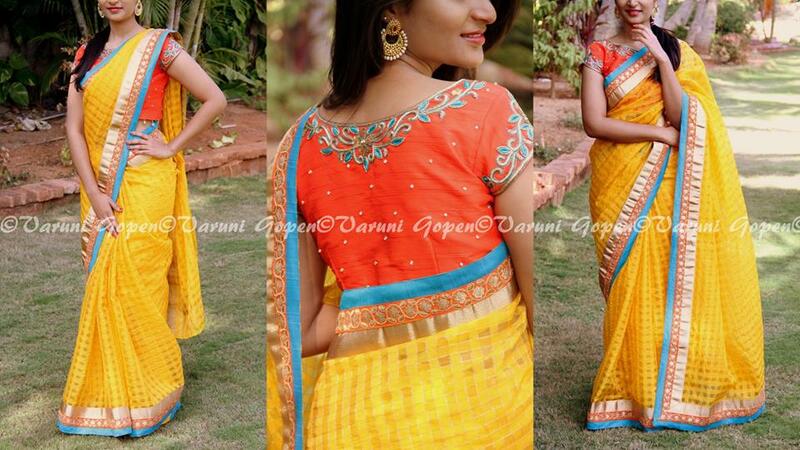 Sometimes throwing in a completely contrasting color with fine thread work would project your saree in a new light. To be more dramatic here, you can choose for long sleeve or collar neck along with this enticing thread work. We all love a gold blouse! Don’t we? Why not buy such an all-purpose blouse with a on-point pattern like the one below. Add a sleek thread detailing on the back to look more cooler. Define your boat neck blouse by having an attractive kundan work like the one below. 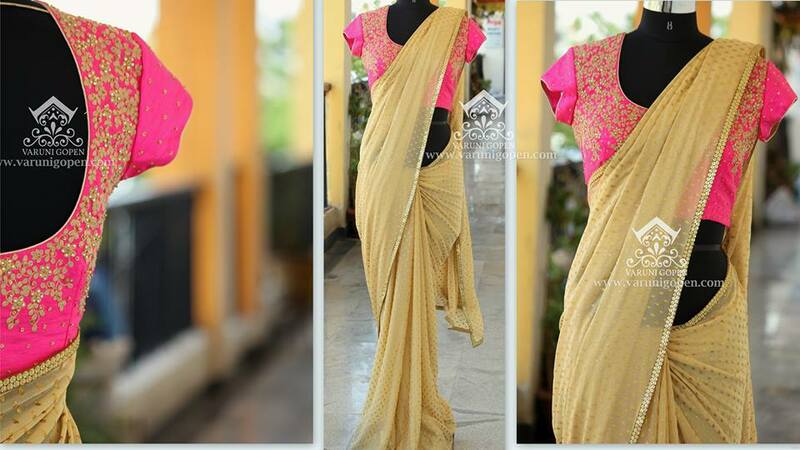 Use unusual color combinations to give a surprising twist to your sarees. A deep U or V neck with velvet border on your brocade blouse is such a genius idea to try and relish. We mean, this choice would look fabulous on any color! Short sleeve with high neck blouses are trending model of this season. 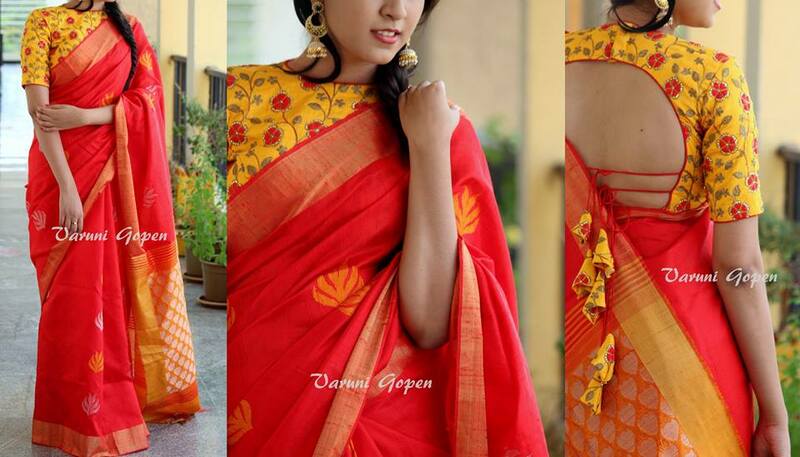 If you plan to wear this combination with your silk sarees, make sure you have a highlighting thread work on the blouse back neck and on the sleeves. Blouse with deep back neck and tiebacks are not at all new. However, make this stylish combination even more alluring by opting for pearl works. Nothing can beat this fine adornment, right? Sometimes, you really don’t need any fancy blouse back to garner all attention. 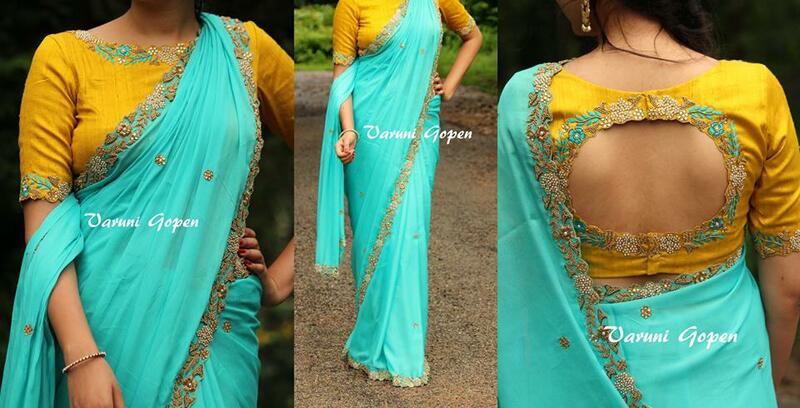 Even a fully covered back with structured sleeves would still make your saree style an enviable one. Bold customized designs on your ordinary blouse, are a fail proof way to invest on blouse this season. It could literally suit anyone and make others inquire about your blouse purchase. 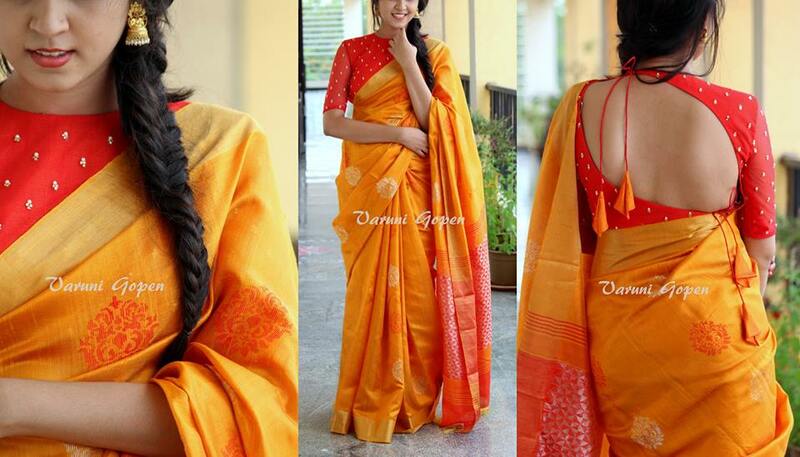 There is no denial that sometimes we all do carve to opt a fancy blouse style to wear silk sarees too. Make this dream come true by going for peplum blouse design. A simple sleeveless blouse with a delicate thread tie-up should be etched as a classic blouse style of all time. It is never going to lose its charm. Flattering cuts and attractive patch works in contrasting colors, is another interesting way to keep your blouse style fresh. 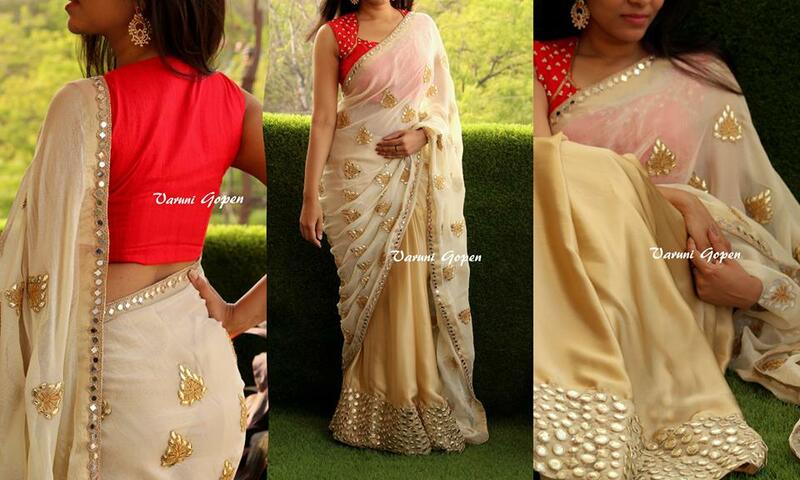 Adding a tassel detail on the tie-backs is probably the most known way to embellish a silk saree blouse. Give this style a twist and try those tassels on back open neck at unexpected places like below. 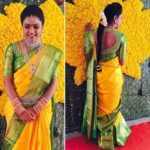 If you a thing for mirror and the cool glittery feel it brings to your outfit, try a row of clean mirror work on your silk saree blouse as well. Use contrasting colors to highlight the mirror details. 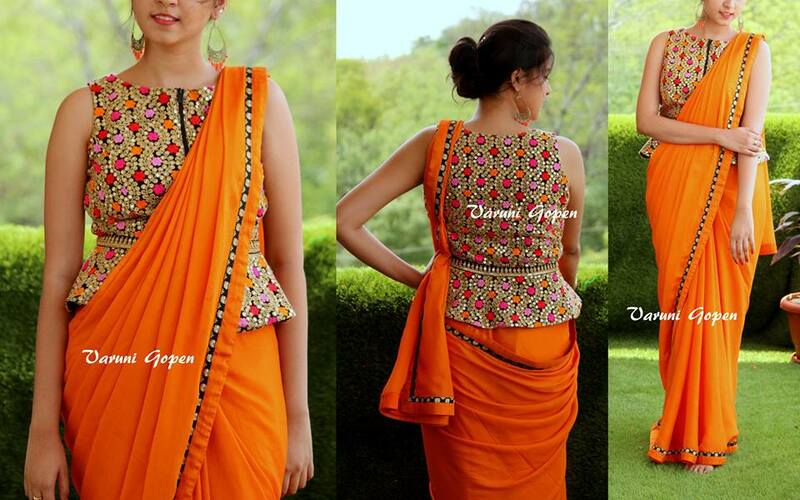 Give your ordinary blouse back neck a stylish spin by opting for exotic patch work like below. When you go for patch work blouse, try a net fabric with subtle embellishments. It is a winner any day. 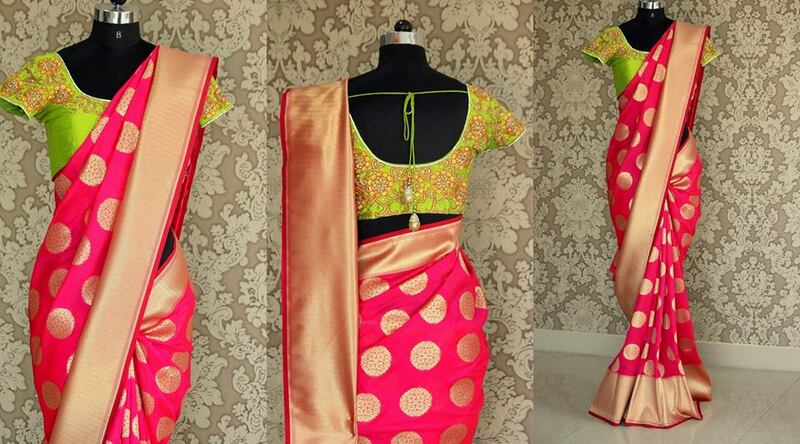 Front wrap blouses are for those who like to give a modern look to the traditional sarees. Use attractive standout hues to make the blouse look fashion forward! Deep V neck with a long sleeve blouse, and lavish thread details on the shoulder, would make even the dullest saree shine through amidst your fashion crowd. To up your style game, try a deep back open with high neck blouse, and finish off this uber cool blouse with sleek double layer tie-backs. This is for those, who feel less is enough. Boost your blouse’s festive look by opting for classic beads work in the neck and sleeve borders. It would cost you less but will give you a more-expensive-looking blouse style. Innovative back opens and tiebacks at unexpected places would make heads turn and admire your way of styling. 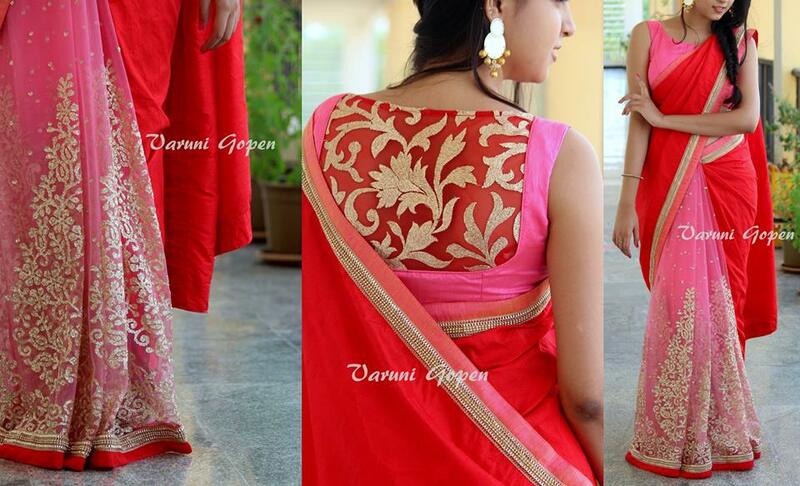 Give this a try if you like to surprise everyone with your saree style. A simple back open and elbow sleeve will even give a regal look to an otherwise plain brocade blouse. When you are too shy to try a deep back neck, how about trying a glittery stone work on your blouse back instead? Give your blouse back neck cut out designs, the much needed style, by opting for zari thread work around the flattering cuts. You don’t have to stick to delicate thread tiebacks all the time. Give this bold cloth knots a try next time. The flattering open and just the right shrinks make this blouse a most creative one on the entire list. Blouse model like this is beyond trendy. You can own this blouse and wear this with any black saree for all the coming years, and still manage to surprise others every time. Shout out for all brides and bridesmaid, this is a universal flattering blouse style that you can’t afford to miss. Throw in some cloth buttons and glittery adornments to give a voguish look to your standard blouse designs. 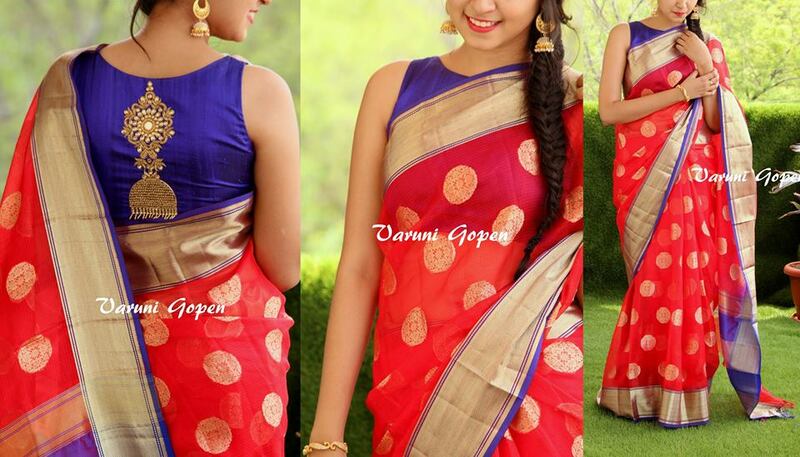 Any deep color blouse need a complimentary work like this to flatter the silk saree it is paired with. This can be worn by anyone without age barriers. If you have hesitation on other choices, then embrace this. 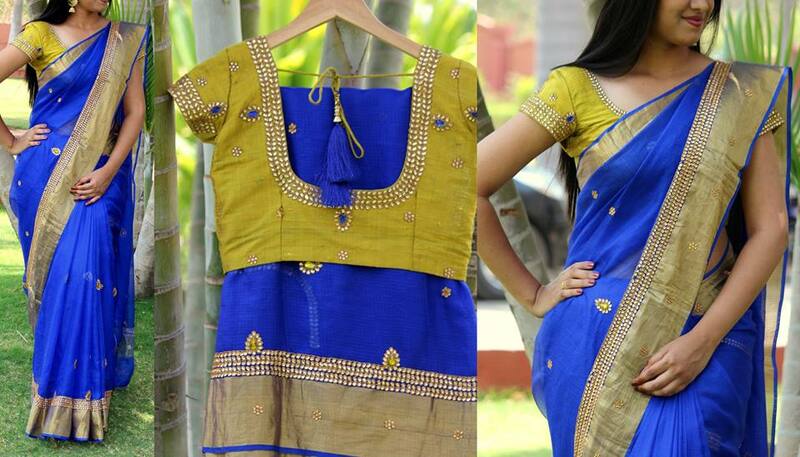 This blouse style can be worn with your silk, and of course later it could be reused with any fancy saree as well. So snag this versatile blouse style soon. Don’t underestimate good embroidery. 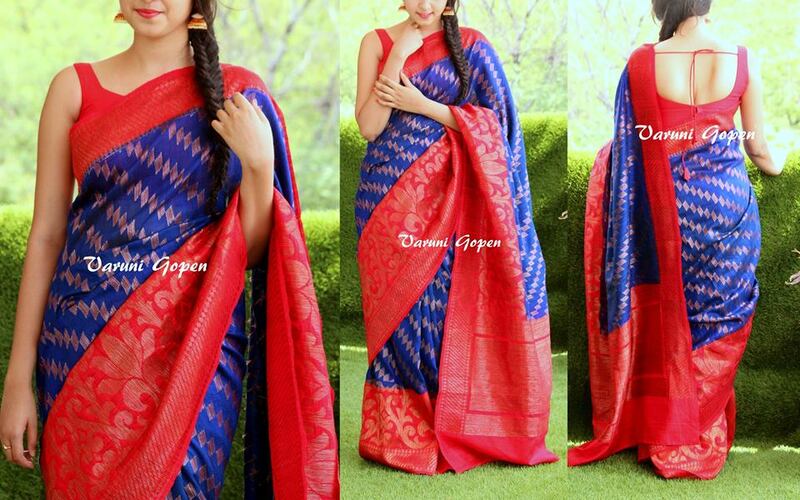 It can impart a royal look to your silk sarees. Here is the proof. 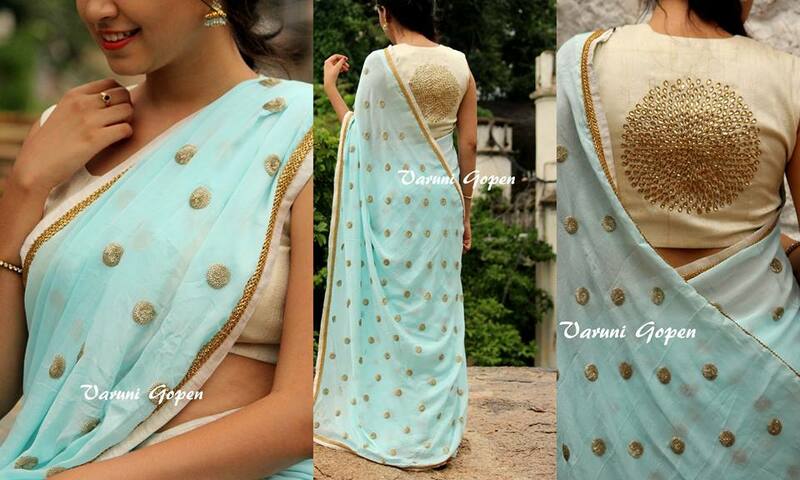 Hope you have sought enough inspirations to perk up your blouse back neck designs for silk sarees. In case, if you like to shop same sarees and blouses featured above, then do reach out the label. The contact details are given below. If you have any other blouse design in mind that needs to be included, do drop a note and let us know. We will upgrade this list. Previous articleReady to Check out Cool Pictures from Samantha’s Wedding? Next articleCan Someone Look So Pretty on a Bright Yellow Anarkali Suit?